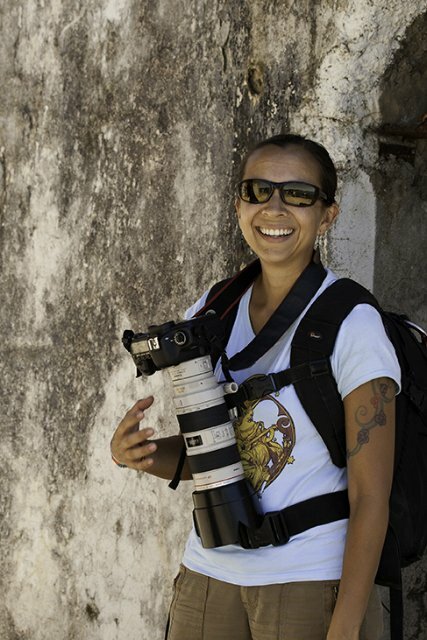 Are you a teacher looking for cultural immersion project ideas for an international trip? Costa Rica is one of the best places for this, especially for students studying Latin American culture and Spanish! In this article, we’ll provide some background on authentic cultural immersion in Costa Rica as well as some cultural immersion project ideas and activities that will leave a lasting impact on your students. If we start discussing what culture is, we might need several long blog posts. The term is widely used when talking about art, knowledge, education, believes, and much more. But what we want to talk about when discussing cultural immersion, is the traditions, activities, ideas, ways of living that are shared by a group of people and transmitted from one generation to another, which become part of the identity of that group of people. Therefore, cultural immersion would mean to place yourself, or your student group, in a place where they are surrounded and invited to experience those activities, traditions, ways of living of a particular group of people, and to learn about the ideas and believes that those people follow. Why would you want to do that? Well because there isn’t a better way for your students to understand, respect and value the diversity of cultures that populate our planet, than actually experiencing a different culture from their own. And once they can respect and appreciate different cultures, they will be better human beings, and they will help make this world a peaceful and rich one. What is Costa Rican Culture? Again, this is a challenging thing to describe in just a blog post. There are books made for this! But we will try to give you an idea. To start, we need to understand that during the pre-Columbian era, Costa Rica was the bridge between incredibly bigs civilizations: the Incas from the South and the Mayas and Aztecs from the North. In this territory, travelers were passing by and commercializing their products, but there was also significant settlements of indigenous communities that are the base to the Costa Rican history and culture. Once the Spaniards took over the territory, a much bigger mix of cultures started to happen. Spanish people came and settled in Costa Rica and mix with the indigenous community, but the area found itself a bit isolated from more significant settlements like the ones in Mexico and Guatemala. This had a meaningful impact on the Costa Rican culture. The way of living of the new population was relatively relaxed and of subsistence, the beginning of the Pura Vida (pure life) way of seeing the world, with a little bit of complacency, slowness and apprehension, but at the same time appreciation and search for the family’s and one’s well being and tranquility. As a funny example, Costa Rica’s independence was signed and declared in Guatemala on September 15th, 1821, but Costa Rican leaders did not hear about it until October 13th of that same year and even though the decision was made and firm for a while, they still had to sit and discuss before accepting it. Nowadays, it is a big part of Costa Rica’s identity, and it is celebrated every September 15th, with parades, music, and decorations all over the country. During the Spaniards colonization, African slaves were brought to Costa Rica, adding another culture to the melting pot. After, during the construction of the railroad between the Central Valley and the Atlantic Coast, in the late 1800s and early 1900s, a significant population of Chinese people came to work in Costa Rica, becoming another element of the Costa Rican culture. Also, African-Caribbeans joined the working force behind the railroad and stayed in Costa Rica. Today, Costa Rica is still a bridge between cultures and countries, a place to migrate and settle. Therefore the melting pot is still working with a population of just over 5 million inhabitants. Many things identify the country and its people, but it is mostly known for its commitment to peace (by abolishing the army in 1949), education, and health. 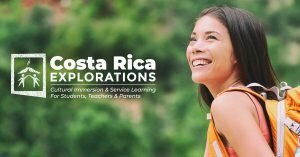 How to Make your Student Trip to Costa Rica a Cultural Immersion? Jumping on a plane to a different country is not really a cultural immersion. Yes, you will see different ways of living, diverse landscapes, probably hear a different language, and observe different people in general, but that doesn’t mean you will understand this new culture at all. And on top of it, you can take a trip to the most different country you can imagine, that if you end up staying in a standardized resort, then you might as well just have traveled to the same resort that is closer to your home. When you are organizing the cultural immersion projects and activities for your student trip, the most important thing you need to do is research the projects and activities you participate in to make sure they are authentic and not just another tourist attraction. 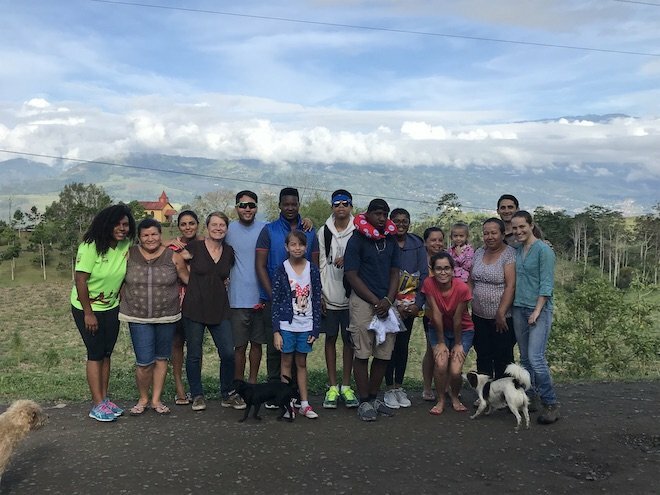 If you are reading this post, but you have not decided yet where to take your students to experience that cultural immersion, we would like to highly recommend you to consider traveling to Costa Rica and experience the Costa Rican way of life, the heart of the country, the Pura Vida (pure life). And how can you experience the Costa Rican way of life? We at Costa Rica Explorations are experts in doing just that. We provide authentic cultural immersion, as well as service-learning based, and adventure programming for students of all ages. 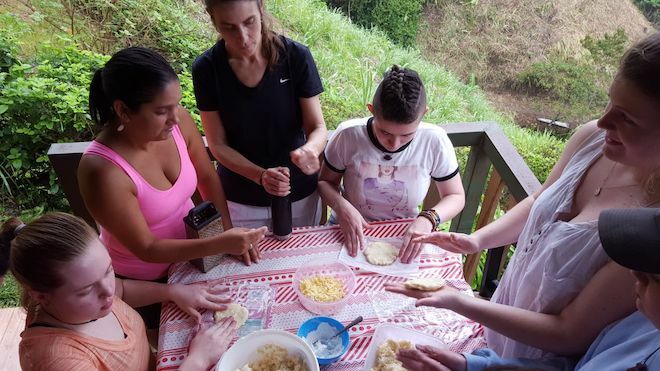 During the programs organized by Costa Rica Explorations, the cultural immersion happens when students participate in authentic Costa Rican homestay experiences, indisputably the best way to experience a real cultural immersion. Eating typical meals with the family. Having the opportunity to experience meals will help your students understand the rhythm of the day of a Costa Rican. For example, a typical Costa Rican breakfast could have Gallo Pinto (the most iconic Costa Rican dish that consists of mixed Rice and Beans), some tropical fruits, and/or a piece of Turrialba cheese and/or some eggs. Why such a big breakfast? Because in rural areas like Turrialba, the day is long and the work is hard in the farm fields, and the family must start the day with the right kind of energy. Experiencing the extended family way of living. In Costa Rica, the family unit is one of the most important things, but it goes further than mom, dad, and children. In this country, cousins, uncles, and aunts, grandparents, and their relatives, they are all family, and they are kept close to home. The culture of family in Costa Rica is involved, and it’s big! Way of travel for the family. Either they take the bus, bike, motorbike or car to the center of town, the relative’s house, the family reunion, it will be an excellent experience for the student to understand transportation and how that affects people relations and actions. Enjoying free time with their host family. 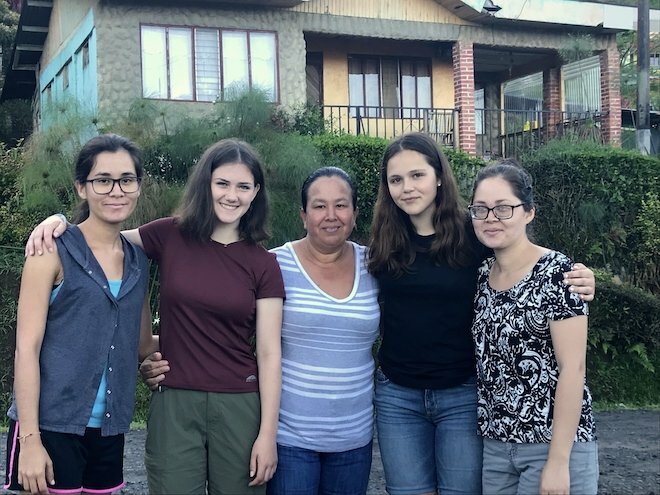 It could be that they walk to town, or watch the trending Telenovela or the national news or the latest Costa Rican TV show, or by teaching each other about Costa Rican history and traditions, every second, even if it’s for leisure, there is an opportunity to learn. Attending for a few hours/days the local public elementary school, where all students wear uniforms, and the teacher follows a nationalized curriculum. In Costa Rica, primary schooling is mandatory and it is a right for every child. Whether or not they have the means to pay for school, every child has a right to an education. 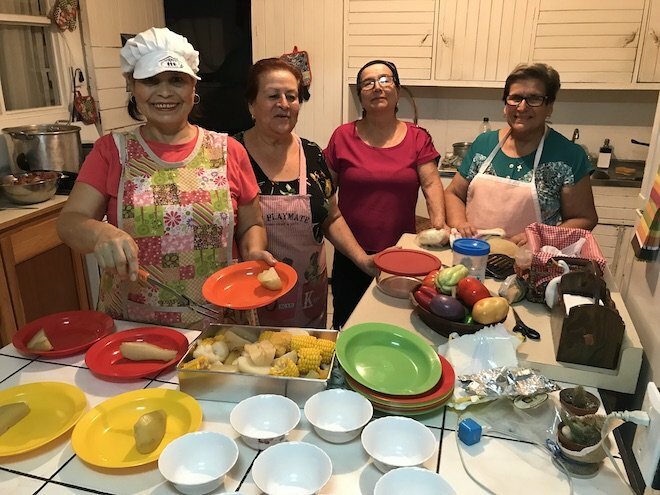 Participating in a Costa Rican cooking class where they can learn to make tortillas, empanadas, enyucadas, agua dulce, agua de sapo, cajetas… All of them delicious Costa Rican staples and treats that will give them a good idea of what Costa Ricans value. Another good point, these dishes can also be reproduced at home when the students take home the secret recipes. Participating in Costa Rican dance lessons. 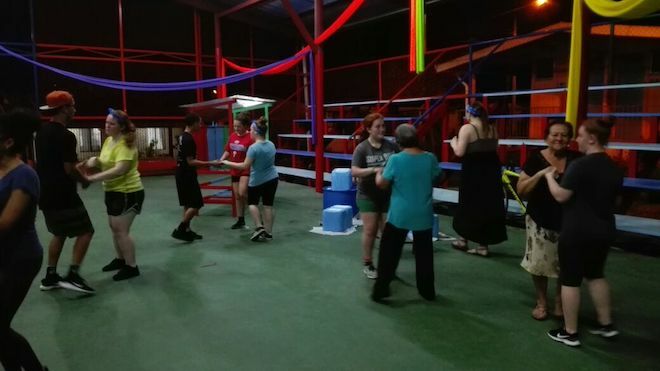 Imagine your students moving to the rhythm of Salsa, Merengue, Cumbia Criolla (a traditional way of dancing Cumbia in Costa Rica). The movement of their hips will help them understand the passionate way Costa Ricans and Latinos in general live life. 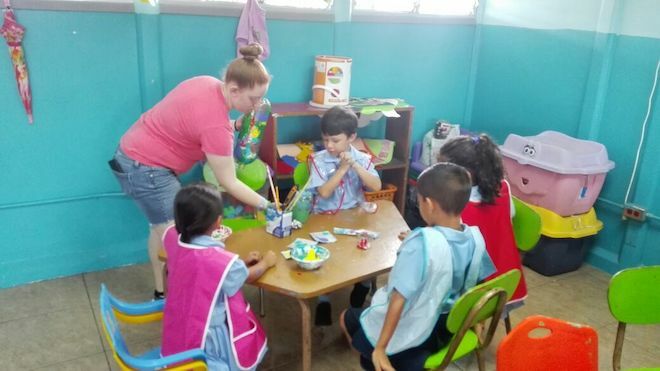 Participating in Costa Rican arts and craft projects. Besides learning about Costa Rican craftsmanship, in an activity like these, you can also encourage other values like the value of recycling and revalorizing waste by turning it into Art. Independence Day festivities on September 14th and 15th. Christmas Traditions like building the Nativity Scene or preparing Tamales. Attending the Pilgrimage to Cartago on August 2 which celebrates the Patron Saint of Costa Rica, the Virgin of the Angels. 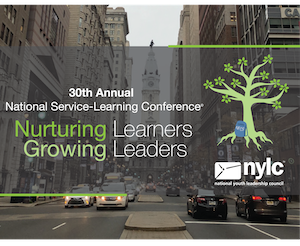 Create the Perfect Cultural Immersion for your Student Trip! We have given you some ideas of the many different projects and activities you can include in your student trip to turn it into a real cultural immersion. We at Costa Rica Explorations have many more ideas, and we are an experienced organization with great liaisons with communities, community members and organizations. Contact us for help with organizing your trip and rest assured that we will make it the perfect cultural immersion that will make your students better people and change agents for the world.